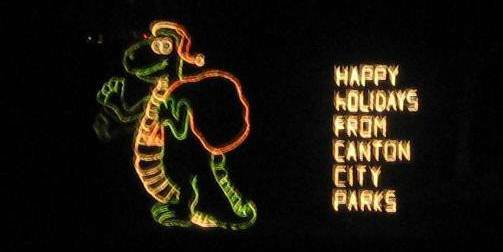 Last weekend we had the opportunity to head to Canton to check out the Christmas Lights in Stadium Park (directions). The annual display is hosted by the Canton City Park System. A train engine pulling seven cars. There are even lights that appear to be puffs of smoke coming out of the engine. Two elves having a snowball fight. 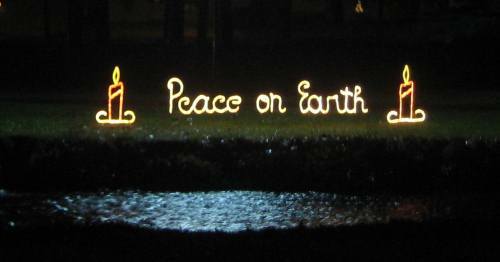 Candles and the light from the words Peace on Earth being reflected in the water. Santa's helpers arranging gifts under a Christmas tree. 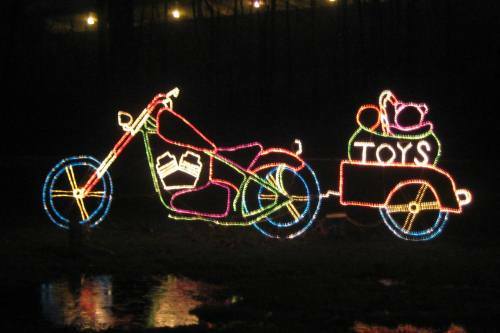 A motorcycle pulling a cart full of toys. And a clown firing a candy cane cannon over the road. In the picture you can see one of the candy canes falling into a bag. While I didn't count the total number of displays I would estimate that there are at least 50 lining the street. The highlight of the drive is near the center where the Canton Garden Center is located. The area around the building is covered in lights, lighted wreaths, trees, snowflakes, a moving carousel and much more. We were also particularly fond of the sea creature in the water and the ski jumping Santa (my picture were too blurry to share). Many thanks to the Canton Park Department for hosting such a beautiful display. If you're in the area I highly suggested checking it out. Have you ever been to the Stadium Park Light Display? If so, what is your favorite part?